The Chestnut Meadow Barn has a shady shelter at the two stall doors and a 10'x24' run-in. 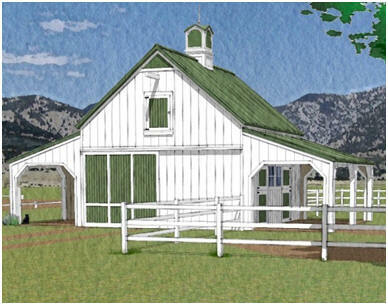 With any of the Chestnut Barn layouts, you can build with your choice of exterior materials. Enclosed floor area is 460 sq.ft. Sheltered area is 480 sq.ft. The Loft floor area is 480 sq.ft.